So at the beginning of the year I discovered a website called Incredible Smoothies. 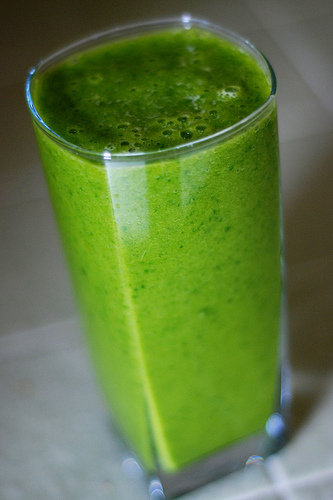 It talks all about making Green Smoothies, which basically are smoothies with lots of spinach or kale or any other dark leafy green you’d like to blend into it! As a non-veggie lover.. this is kind of miracle for me. So my smoothies consist of spinach, bananas, mangoes, some grated ginger and water. Believe me it taste really good, just like bananas and mangoes.. if it weren’t for the awesome green colour you wouldn’t even know that the spinach was in there! So me and the kids have one every morning, and I have noticed a huge difference in my energy which in turn means a difference in my patience and compassion with my kids. Yay! It also has helped with my sugar cravings, which plague me most of the day. I also bought a book called The Thrive Diet which is all about eating lots of plants and raw foods etc.. So I’m trying my best to incorporate as much veggies into our days as possible. It’s pretty easy with the kids. Kurt loves cucumbers, peppers and carrots. Keenin… eats anything! It’s just me and my stupid palate! But I’m getting there. My MIL gave me a book for christmas a few years ago and it was all about how to put puree veggies into any kind of recipe so you and your kids get lots! I’ve read that a lot of parents don’t agree with this because it sort of reinforces people’s thoughts that vegetables are gross and should be avoided at all costs. But I think hidden in the meals and placed on the plate is good enough for our family. I’ve struggled to eat healthy my whole life… so I want my kids to eat their veggie whether they know it or not! Do you like vegetables? How do you get your 5-13 servings of fruits and veggies a day? Do you sneak them to your children?